Jay Silber’s narrations have taught thousands of pilots vital aircraft procedures, surgeons how to implant knees and hips, and software consultants how to implement corporate wide ERP projects. Following years of on camera reporting for the CBS Owned and Operated television station in Philadelphia, Jay Silber employed his skills in a wide variety of fields. Please review the audio samples on this page. 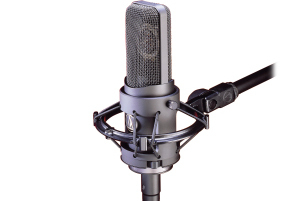 Our audio studio includes the ATA 4060 Tube Condenser microphone for smooth analog sound quality, and a wide array of post production effects when required. Recording takes place in our Whisper Room sound booth. Editing is completed with Adobe Audition CS6. JSVOAV, Inc.’s narration services result in a final, complete product subject to client approval. Rates are extremely competitive! Jay Silber’s narration (and his Instructional Design) helped GE Healthcare’s sales reps learn about GE’s Centricity Cardio Enterprise software suite. Aviation training plays a huge role in Jay Silber’s narration history. In this piece, Jay Silber introduces pilots to the Gulfstream V cockpit. Jay Silber has narrated 16 FSI programs. In addition to designing much of Wal-Mart’s Inventory Management training for Interactive Services, Jay Silber narrated many of the eLearning segments.